Toyota and Intel — in a tense race to own what they see as a gigantic future self-driving industry — have announced yet another new international consortium in order to beat their rivals to the perceived prize. The new group — which also includes Swiss telecoms company Ericsson and Japanese auto parts maker Denso — seeks to standardize a system to handle an extraordinary expected leap in data created by self-driving vehicles and services like realtime mapping apps, and stored in the cloud. In a statement yesterday, Toyota forecast that the volume of data to be transmitted between vehicles and the cloud will grow by 10,000 times over the next eight years — to 10 exabytes per month, equal to 10 billion gigabytes. Why it matters: The announcement is yet another sign of a frenzy around an uncertain yet broadly accepted forecast: that the world's roads will soon be zooming with autonomously driven vehicles. It is a given that light autonomous vehicles — able to stay in freeway lanes, warn of impending accidents, and park themselves — will be here soon. What is not knowable is when fully autonomous cars will be here — in five years, or more like two decades or longer. Until they are, such partnerships may be premature. Who's ahead now: Among chipmakers, Nvidia is far ahead of anyone; its platform seems to be the go-to technology for all the carmakers in the race. In terms of car companies, Tesla and GM have seized the lead commercially, with Google right there in terms of research. But Apple, Microsoft and every carmaker on the planet are furiously competing, too, and no one can be sure who will dominate self-driving in the end. Toyota, which began a big push into autonomous vehicles last year. It began sprinkling $25 million grants around U.S. universities like MIT, Stanford and the University of Michigan, and spent $1 billion on a research institute with campuses in the invention hotbeds of Silicon Valley and Cambridge, Massachusetts. 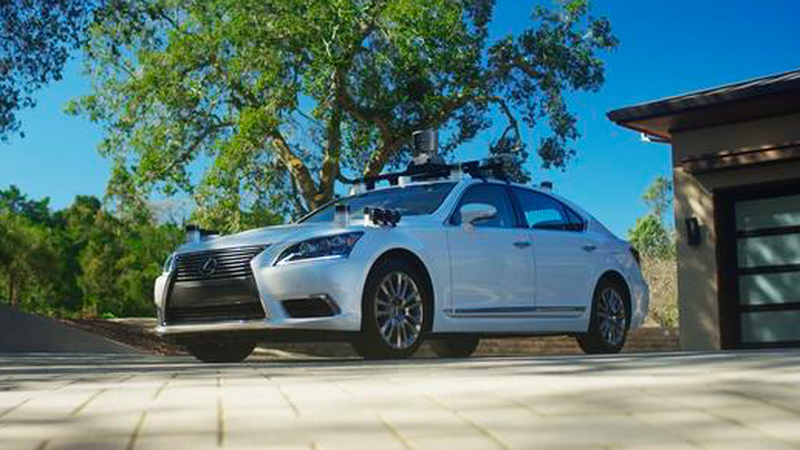 In March, Toyota's institute announced its first self-driving prototype vehicle (pictured above). And two months later, it announced a partnership with MIT and five companies to develop blockchain technology for self-driving cars.